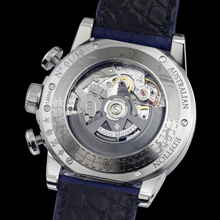 For the 225th anniversary of Australia Day celebration on the 26th of January, 2013, Louis Moinet has launched a special Geograph: Australian Edition. This limited-edition chronograph of 30 pieces pays tribute to icons of Australia: Captain James Cook, the Southern Cross and the colours of the national flag. Geograph: Australian Edition by Louis Moinet is an elegant yet robust two-pusher automatic chronograph with a second time zone. 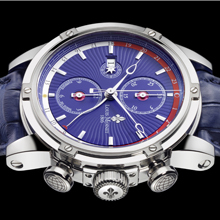 The red, white and blue of the dial as well as the star-shaped small seconds hand at 9 o’clock evoke the Australian flag, while six stars engraved on the case-back represent the flag’s Southern Cross constellation. Engravings of a map and a sailing ship on the lower part of the case-back pay tribute to nautical explorer Captain James Cook, the first European to extensively explore and chart the eastern coastline of Australia. Blue, Louisiana alligator leather with alligator lining, hand-sewn.